Yesterday, we posted a request for stories on the impact of Recovery Act funding. Comments to this post revealed some areas of frustration and misunderstanding that I would like to address. First, I’d like to say that one of the big Recovery Act stories is the scientific community’s huge response with exciting ideas. Indeed, we’ve received many more proposals—including requests for administrative supplements—than we can fund, even at the high level of the Recovery Act allocation. We know how much effort is involved in preparing applications, and we’re deeply grateful to the large number of scientists who have agreed to help review these proposals. At any time, you can use the NIH RePORTER site to view Recovery Act projects funded by NIGMS and other components of NIH. To date, we have awarded approximately $50 million of the $500 million allocated to NIGMS over the two-year period of the Recovery Act. Of these, approximately 130 are supplements to ongoing R01s, 40 are two-year R01s, and 60 are supplements to other award types. Many more awards are in progress! Just as it has been new for you, much of the process related to the Recovery Act has been new to NIH. Since the Recovery Act was passed, NIH staff has been working hard to develop and implement systems that allow decisions and awards to be made quickly while maintaining the standards of fairness, accountability, and rigor that the scientific community and taxpayers rightfully expect. Since this is an NIH-wide and, indeed, a government-wide effort, these processes are extensive. After a recommendation is made and approved to fund a particular award at the NIGMS level, our grants management staff must prepare the award, working with your sponsored research offices to determine the precise amount of the award and to make sure that any outstanding issues are resolved. Some awards can be processed more quickly than others. Then, award recommendations are consolidated at the NIH level and processed further. While we have made considerable efforts in streamlining these steps (and, as noted above, many awards are now working their way through this process), it still takes time, and we are not able to provide much information to applicants until the process is complete. The bottom line is that we are working as hard as we can to get these awards out, in addition to the awards we make with our regular appropriation. If you have not heard anything, it does not mean that your Recovery Act application will not be funded! We will let you know any definitive information—positive or negative—as soon as we can. Also, no awards have been made for any of the trans-NIH initiatives such as the Challenge Grants, GO grants and P30 Faculty Start-Up grants. The Challenge Grants have recently been reviewed and scored. NIH, through the Office of the Director, had committed to funding 200 Challenge Grants. Many institutes and centers have set aside funds to support additional Challenge Grants. My best guesstimate is that something like 600 Challenge Grants will be funded NIH-wide. The review processes are still under way for the GO grants and P30 Start-Up grants. None of these awards will be made until close to the end of the fiscal year (September 30), as these applications must all go through review by the advisory councils. I hope that this helps clarify some of the major points of concern. Please let me know if you have additional questions. Whether you’re interested in a single protein or many, you now have the chance to join the Protein Structure Initiative’s PSI:Biology network, which will apply high-throughput structural approaches to solve interesting biological problems. Centers for High-Throughput Structure Determination – large-scale centers that will have the capacity to solve structures on the order of several hundred per year. Centers for Membrane Protein Structure Determination – small centers that will devote special effort to solving the structures of these proteins. Consortia for High-Throughput Enabled Structural Biology Partnerships – these awards will support functional studies of proteins proposed by individuals or groups of researchers from across all fields of biology as well as support the structural determination of those proteins through consortia with the PSI:Biology structure centers. Ideal projects will integrate functional and structural data for a large number of protein structures to solve significant biological problems. In addition to these opportunities, we plan to issue program announcements for experimental technology development, computational and molecular modeling and more ways for partners to bring their interests to the target-setting table. We’ll announce these in the NIH Guide and here in the Feedback Loop. If you have just one or two proteins that need to be solved, you can nominate them as targets for structure determination via the PSI Structural Genomics Knowledgebase , which offers a cool widget so you can easily access the site from your Web page. UPDATE: The due dates for letters of intent and applications have been extended to September 28, 2009, and October 28, 2009, respectively. For more details, see NOT-GM-09-026. What’s Your Recovery Act Story? If you’ve gotten funding through the American Recovery and Reinvestment Act, you know how important it is to tell people in your community that this support is having an impact. We want to hear from you, too. Your stories can help us show the American public how the Recovery Act is working to accelerate research, stimulate the economy, and create or retain jobs. So please tell us about how this funding has helped you. The impact can be large or small, immediate or long-range. Did you hire a promising new scientist or keep someone from losing a job? Were you able to form new collaborations or purchase critical equipment? Did the Recovery Act help speed your research, enable you to make new discoveries, or advance science in other ways? For training programs, were you able to develop new curricula or other activities that you would not have been able to do otherwise? We invite you to share your experiences now and in the future using our What’s Your Recovery Act Story? (no longer available)+ Web form. We’ll post a sampling of what you send us on our new Recovery Act Impact Web page. Check out the ones we’ve already posted there to see what your colleagues are saying. 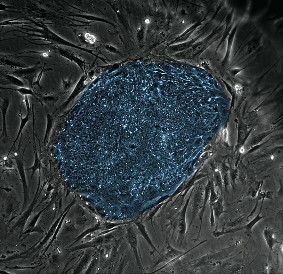 New NIH guidelines for human stem cell research became effective on July 7, 2009. We thank those of you who provided comments on the draft policy. The input NIH received was instrumental in developing the final guidelines, which will generate a new registry of human embryonic stem cells (hESC) eligible for use in NIH-funded projects. This registry will be posted at http://grants.nih.gov/stem_cells/registry/current.htm. NIH has now issued guidance on the status of applications and awards under the new guidelines. I’ve summarized the main points below, but see the notice for other important details. New and competing applications may be submitted and reviewed. Until eligible hESC lines are listed in the new NIH registry, applicants should not identify a specific line, but should state that they will use line(s) from the registry. Ongoing awards that use previously approved NIH hESC lines may continue to use these lines for research for the duration of the currently approved award. Administrative supplements (including Recovery Act ones) may be funded if the supplemental activities use the same hESC lines approved for the parent grant. Previously reviewed pending applications may now be awarded. However, these awards will be restricted from using funds for hESC research until the hESC lines to be used have been posted on the new registry. The NIH guidelines and notice represent important steps forward in removing previous barriers to hESC research and advancing this very exciting and significant area of science. We’ve posted a new job listing (link no longer available) for a position in the NIGMS Division of Cell Biology and Biophysics. This position is for the Chief of the Structural Biology and Proteomics Technology Branch. This person will oversee the scientific and administrative management of the branch, which supports research using genomics or computational approaches to study protein structures and functions as well as the development of new tools to facilitate this work. In addition to handling a portfolio of research grants, the branch chief will also direct the Protein Structure Initiative. The listing closes August 11, 2009. Spread the word! UPDATE: This vacancy listing has been extended to August 18. 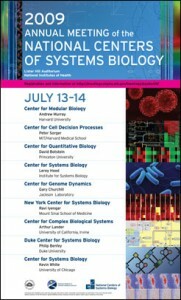 Earlier this week, I attended the annual meeting of our National Centers for Systems Biology, which was held at NIH. This was the 5th meeting since the program started in 2002, and one of its goals was to introduce NIH research staff and administrators to the exciting developments and applications of systems biology as well as the activities of the nine current centers. Every year, I am more and more impressed with how systems biology has blossomed. This year, I was particularly pleased to see the sophistication and enthusiasm of the students and postdocs being trained at these centers. The junior scientists made a lot of new contacts over coffee and during the poster sessions, and the investigators benefitted greatly from interacting with each other, especially talking about how they handle the other goals of the centers program, such as outreach and training. A number of new collaborations were hatched. The science presented by each center was very thought-provoking, especially the “lightning talks” delivered primarily by student presenters who had to get across the aim and conclusions of their research in just one or two minutes and using only one slide! Outside the formal meeting, the investigators talked about the future of careers in systems biology and the professional paths of some of the students who have completed their training. It appears that the students aren’t having difficulty finding positions! There were some concerns that the intrinsically interdisciplinary nature of systems biology might pose some challenges as new hires seek to replicate the intellectual atmosphere, facilities and instrumentation that they became used to having. And, there was the question of how tenure would be handled in traditional departments with established boundaries. Most of the investigators thought that systems biology, like “molecular biology” before it, should be viewed as an approach, not a defined discipline, and that systems thinking would likely permeate the establishment as it matures. I suspect that this year’s participants, like myself, experienced a strong sense of being part of a rapidly developing new wave of science. My overall impression is that the future of systems biology appears to be in good hands—an outcome we hoped for when the centers program was designed. If you’re interested in systems biology and the abstracts of the science presented, you might check out our new portal for the centers, which made its debut at the meeting. It’ll be the clearinghouse for center activities and resources. It will also have a lot of information on available courses, lectures, research/job opportunities, funding announcements, available data and software. We know you’re eagerly awaiting Recovery Act funding decisions and curious about how we plan to distribute these funds. Although we still don’t have all the information we need to make firm allocations, I can provide the following snapshot of what we’re currently projecting. About three-quarters of NIH’s Recovery Act appropriation was distributed to the institutes and centers, which have considerable flexibility in how they invest these funds. Our strategy at NIGMS is a diversified one, as shown in the figure below. Applications in the first five categories (blue) were submitted and reviewed prior to the Recovery Act. The next three categories (red) are Recovery Act programs that solicited new applications, which are now being reviewed. The final category (black) includes supplements to research centers, research management and support and some other programs. Some institutes that had very low R01 success rates are using nearly all of their Recovery Act funds for two-year grants to support previously submitted and reviewed applications for R01s and other grants. NIGMS has maintained a higher success rate, in part by making relatively large administrative budget adjustments to funded grants. We know that this approach can make it difficult to achieve some grant aims in a timely manner. The Recovery Act offers an opportunity to accelerate the pace of this previously peer-reviewed and funded research while creating jobs and stimulating the economy. Because our success rate is higher than those of most other institutes, we are making a relatively large number of Recovery Act awards for administrative supplements and revisions. The next largest category, two-year research project grants, will support exciting proposals that we were not able to fund with our regular appropriations. We are not making awards in a formulaic manner, but rather on a case-by-case basis. For two-year grants, each applicant can renegotiate specific aims as appropriate. We are working to award Recovery Act funds as quickly as possible to benefit the economy and drive scientific progress. Applications for the GO, Challenge and faculty start-up P30 grants are now in, and peer review is under way. Once this review is complete, we will make funding decisions consistent with the areas of interest we stated in the funding announcements. But even applications that were previously peer reviewed must go through additional steps before we finalize each award. To help the American public see the distribution of Recovery Act funds in their communities, NIH recently launched a beta version of a Recovery Act funding map. You may be particularly interested in the option to list all grants at an institution, available by clicking on a state in the drop-down list or the table below the U.S. map. As we move ahead in making these awards, we are also looking forward to tracking the impact of the funding on stimulating the economy, creating and retaining jobs, and producing exciting new results. We look forward to hearing from you about these outcomes and will be providing additional mechanisms to make this easy for you to do.